A rally in support of Noé Arteaga and temporary migrant farm workers seeking justice and dignity in Quebec. Les Serres du St-Laurent Inc, a Quebec company which produces Savoura tomatoes, summarily fired and deported Arteaga Santos to Guatemala after he and other workers participated in a work stoppage to draw attention to the plight of a fellow worker, who was not receiving the medical treatment he needed. Noé Arteaga Santos, a former temporary migrant worker, has brought a complaint before Québec’s Commission des relations du travail against Les Serres du St-Laurent Inc, a Quebec company which produces Savoura tomatoes. The company summarily fired and deported Arteaga Santos to Guatemala after he and other workers participated in a work stoppage to draw attention to the plight of a fellow worker, who was not receiving the medical treatment he needed. After returning to Canada, he launched the complaint to protest this and other unjust treatment by Savoura. The complaint has gone to arbitration, and the next arbitration hearing will take place on Friday, May 11th. Under Canada’s Temporary Foreign Workers Programme (TFWP), Quebec agri-businesses increasingly rely on cheap “disposable workers” from Guatemala, Mexico and other countries in Central America and the Caribbean. More than 4000 temporary Guatemalan farm workers are employed in Canada, mostly in Québec. Canada, in fact, relies on foreign workers to satisfy different industry and service demands for short-term cheap labour in sectors like seasonal agriculture, live-in care-givers, oil sands construction, and food-processing. But reforms that were brought in last December prevent temporary workers from getting status in Canada by restricting them to working four years in Canada and then barring them from returning to the country for six years. While workers are barred after four years, employers are free to continue to bring workers from different source countries. This entrenches a permanent workforce that is expendable and powerless in exercising workers’ rights – an exploitable underclass of vulnerable workers who live without status and who are deprived of the most basic protections. In this context, those who dare to speak out against violations or insist on their contract rights, like Arteaga, are quickly and brutally dealt with. It is crucial that others in Quebec, who benefit from the fruit of their labour, stand up in solidarity. The 2011 reforms are part of a larger shift in Canada’s immigration policy towards creating a disposable migrant workforce with few rights. Since 2008, the number of workers admitted through the temporary foreign worker program exceeded the number of those admitted with permanent residency. Refugee quotas for 2010 were slashed by 60%, and deportations have doubled in the last decade. The number of permanent residents is decreasing each year. Funding for family reunification programs has been cut, and there is restricted access to citizenship through skilled worker programs for people who respond to a designated 38 occupations. The newly introduced Bill C-31 proposes further reforms that will make it more difficult for refugees to get to Canada and will punish some of those who do make it with mandatory detention and more barriers to status. The first Montreal International Women’s Conference hosted by the Committee of Women of Diverse Origins is set to get underway August 13-16, 2010 in Montreal, Quebec. For close to a decade a group of Montreal-based women have been working tirelessly to improve women’s lives here and abroad. 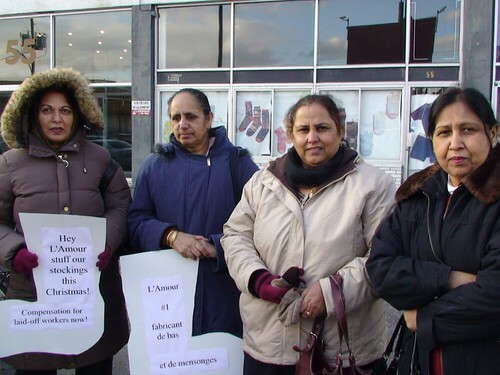 They are the Committee of Women of Diverse Origins, and as the name suggests, their members have roots in several countries and they take on a number of social issues from migrants’ rights to violence against women. What makes their approach unique are their strong links to and participation in women’s struggles in their countries of origin including the Philippines, Sri Lanka, Iran, Palestine, Pakistan, Mexico, Ecuador, and Mali, bringing militancy and a truly global perspective to their work here in Quebec and Canada. August 13-16, 2010, the Committee of Women of Diverse Origins will host the first Montreal International Women’s Conference with the theme of Building a Global Militant Women’s Movement in the 21st century. They are joined by co-conveners from the south including Gabriela Philippines, Asian Rural Women’s Network and Action Network for Marriage Migrants Rights and Empowerment (AMORRE).